Welcome to this weeks post of WOW! Each week we share a little bit from an ARC we have laying around. Please understand that this is from an Advance Reader Copy so what we share may not be the same in the finished copy. Have a book you want to know more about? Let us know in the comments! Mary Margaret Miller is going to be a junior bridesmaid--that is, if she isn't grounded for the rest of her life. She's feuding with school bully Brent Helzinski, and her cousin Eden, aka The Bride, is clashing with her grandmother about wedding plans. 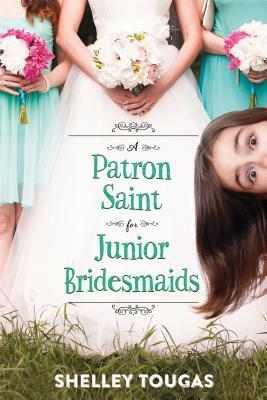 Mary knows it's her job as a junior bridesmaid to make the day run smoothly, but she sure could use a little help from above. Shelley Tougas is an award-winning writer of nonfiction for children, including Little Rock Girl 1957, and the author of the novels The Graham Cracker Plot and Finders Keepers. She lives in Hudson, Wisconsin. Someone hacked Eden's e-mail account. That's the only explanation. My cousin has never mentioned a guy-ever. She works in a hospital laundry to avoid people, and she takes college classes online for the same reason. Eden's social life revolves around church bingo with Grandma. I start my computer's virus-scanning software in case I got infected by opening the message. Once Grandma replied to an scam e-mail about a Nigerian prince who needed money so he could hire a lawyer to collect his inheritance. She told the fake prince she'd be happy to help out as long as he paid her back. Aunt Maggie took her computer to a shop to have it cleaned up so the scammer couldn't get Grandma's personal information.